About a week ago, the new Bond film (it’s English, so I don’t have to call it a movie) Skyfall came out, and although sceptical at first, I saw it in IMAX “slightly uncomfortably large” resolution, and thoroughly enjoyed it. Probably moreso than my more cynical co-cynic Chapman saw fit to, hence the recalcitrant counter-review. Skyfall is directed by the already very accomplished Sam Mendes and is the continuation of the Daniel Craig Bond saga, although it actually has very little to do or in common with its predecessors. Skyfall may actually be my favourite Sam Mendes film, for its smooth combination of wit, grit and action, but without the usual pretense of “like, it’s so deep and clever man” that I have come to expect from him. 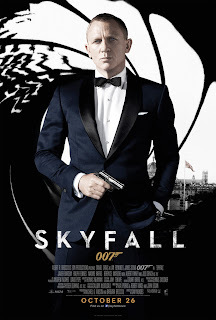 Now some fans might expect to see a Bond film purely for the action, and in this respect Skyfall doesn’t disappoint. The action scenes may be slightly more diffuse than usual, but they are generally very pleasing to watch (moreso in the second half), and the building of tension before an epic shootout is well deployed throughout. But perhaps most crucially, Skyfall is incredibly well written, and for once the plot is a worthwhile complement to the spectacle, and is probably good enough to hold anyone’s attention in its own right. It’s a fairly standard revenge story, but with an enigmatic, almost Joker-like villain (portrayed brilliantly by Javier Bardem) at its heart. The writers give credit to the audience’s intelligence by (almost) never forcing the villain into oversight or complacency purely to give our hero the upper hand, and the execution of this philosophy makes for a very convincing and balanced showdown between the two. On the other hand, as my associate Chapman noted in his review, there are maybe one or two times when his mastermind-like grasp of the whole situation gives him a little too much foresight, but this is extremely far from cheapening the quality of the story. Skyfall also miraculously does more to portray a solid relationship between Bond and M than the sum of Casino Royale and Quantum of Solace combined, which affords the film some real emotional impact as it arrives at its tempestuous climax. Judi Dench rises admirably out of the role of an arbitrary peripheral character and into the plot’s main focus, which can be thought of as one of the factors that makes Skyfall more like a ‘film’ and less like a ‘Bond film’. Filling the gaps on the sidelines are the new Q, a slightly smug brat played by Ben Whishaw, and Eve “the woman” played by Naomie Harris, who is surprisingly a proper character rather than vapid eye candy. That said, Mendes has very carefully tread the line between two sets of expectations; traditional Bond and credible drama. As a result of this, it’s interesting to note how the tone of the film changes as it goes on. The opening scene is immediately reminiscent of the previous two instalments, with Daniel Craig and some indeterminate villain racing through a vibrant urban jungle on foot and motorbike, interspersed with the usual ninja-like free running displays and culminating in a frenzied and breathless fisticuffs on top of a speeding train. The rest of the first act comprises various familiar scenes of stereotypical ethnic mafias, alluring femme fatales, and Bond’s purely innuendo-based conversations with his female sidekick. However, after the point where Javier Bardem is introduced as the villain, the mood of the film becomes a little more dark and sadistic. This feeling persists particularly in the scenes where Bardem is onscreen, as his performance is so overflowing with malice and vengefulness. By the end, Skyfall is rather uncharacteristically bleak, and frames the chaos and violence in a more solemn way. Overall, in my opinion Skyfall is an impressive film for having the ambition to combine a serious story with high-budget action, but while avoiding the pitfalls of lazy writing and leaky plot that have tarnished similar efforts (eg the acclaimed but frequently flawed Dark Knight Rises). Even if you hated Casino Royale and the atrocious Quantum of Solace, you should watch Skyfall. This was an interesting counter-insight into the film and proof there is always two sides to an argument. Enjoyed! I think that between the two of you, you managed a thorough analysis. Great way to review things. I agree, it definitely had more going for it than against it. Who cares about product placement anyway?